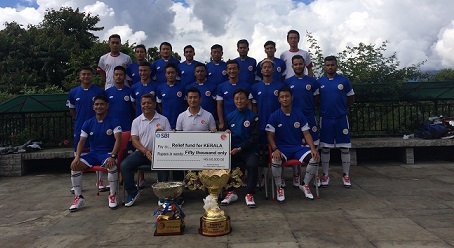 The champion of Premier Division Sikkim League 2018, the United Sikkim Football Club has donated the cash prize of Rs 50,000 of the league to the relief fund for the flood affected people of Kerala on Saturday. In a small function here on Saturday, the United Sikkim FC owner and former Indian football team skipper, Bhaichung Bhutia congratulated the whole squad for their outstanding performance in the league. The club also distributed the newly football kits of Lotto to players. The function was also attended by senior manager Arjun Rai, coach Mayal Dok Lepcha and players of the United Sikkim FC. Speaking to media persons, Bhaichung stated that the club will be playing the upcoming second division I-League and Governor’s Gold Cup football Tournament at Gangtok with no major change. He complimented the efforts and commitment of every player of the club to became the champion of the premier division league for the second consecutive times.